This week's Photo Prompt from Sally Russick of The Studio Sublime, "Foodie!" Food is one of my favorite subjects. The growing, preparing and eating of same - Nom, nom. I have tried to photograph food, with varying results. 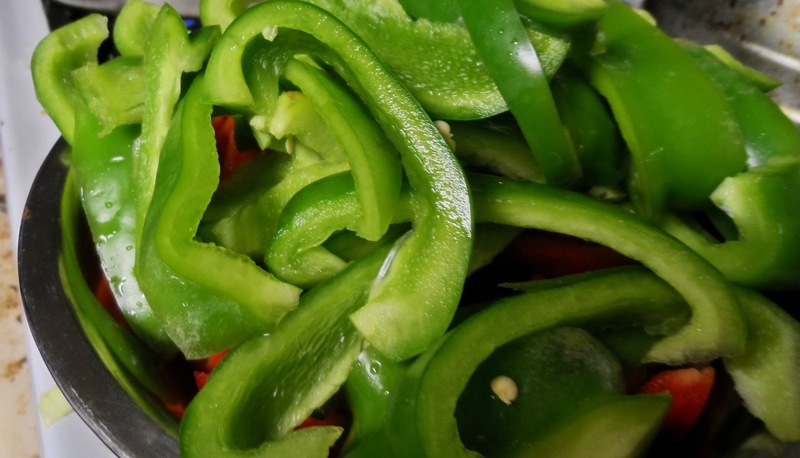 Here's the progression of some green and red bell peppers, and also some yellow onions from crisp and fresh, to ready to be placed on a sausage sandwich. Crisp and fresh, ready to be cooked. 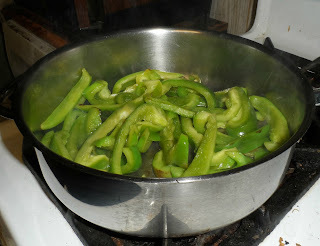 Green peppers first, they take longer because they are not ripe! As they start too cook down, the onions go in. Cover and walk away...ooops, a little overdone! The essence of cooking, encouraging a state of change! See how others have interpreted "Foodie!" at Sally's Studio Sublime. I like this post and how you showed the changing colors of the food! Oooo - love the colors of those beautiful peppers. And you are right about photographing food. It's as tricky as jewelry. Lynn sort of stole my comment... 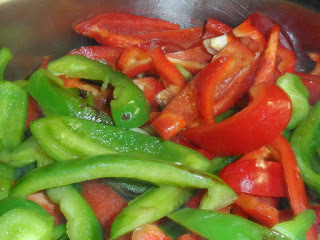 I was going to say how lovely the peppers were while they were still bright and fresh! Love the bright colors you captured of the peppers. Nothing smells as good as onions and peppers cooking, unless maybe it is garlic. Beti you peppers look wonderful. My husband would eat a green pepper like most people eat apples. I buy a couple of cases at the farmers market each fall and freeze them for use all winter. 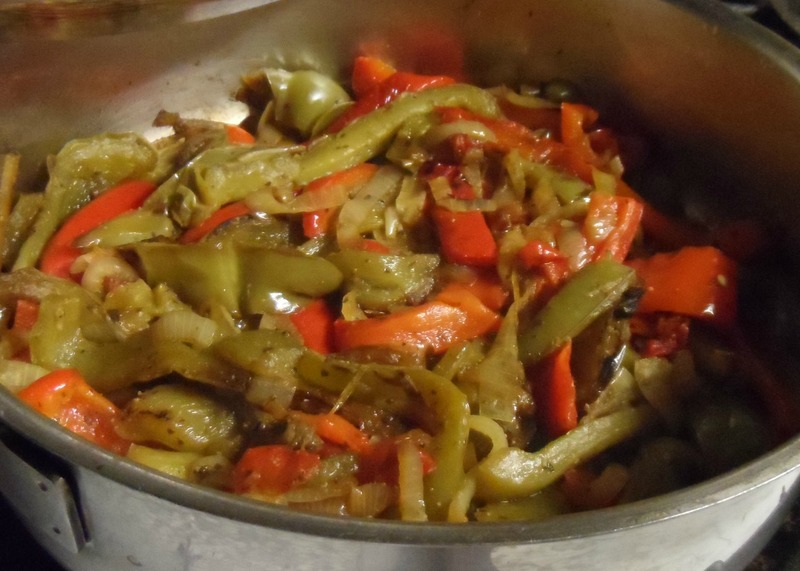 We just had sausage sandwiches with those beautiful red and green peppers, and you are so right. Nothing tastes better, even if they do cost a dollar each! Oh my the worst is when I am cooking something and get distrated and one of the kids says...Is dinner ready yet?...HUH?...Then you run to the pan and hope you can save it! Good thing peppers are great this way! I didn't realize green bell peppers need to cook longer. 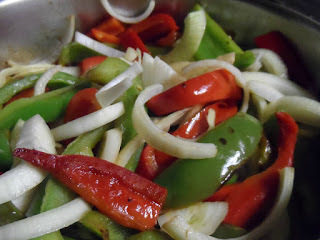 I love making fajitas with bell peppers and onions. And now I'm craving them. you've photographed one of my favorite things to eat. I love them on sausage sandwiches. Mmmmm... I'll bet those sandwiches were great! Oooh, I bet those sandwiches were really yummy! Enjoy! This looks delicious and sounds even better!